The BA (Hons) Accounting and Finance is an excellent springboard from which to launch a professional career in accountancy or to pursue further study. It is well established, and is designed to provide a thorough understanding of the principles and practice of accounting and related subjects. Students on the course have the flexibility of developing and building their specialist knowledge within an Accounting and Finance context whether in industry or public service. The award covers an in-depth knowledge of the core areas for those intending to move into the Accounting profession as well as those specialised areas such as tax, forensic and investment. The programme also includes an option for students to undergo an industrial internship programme which will equip them with practical employment skills. Bachelor in Banking & Finance programmes are designed for those seeking to embark on a career in the banking or financial services sector. Either conventional Western banking practice or Islamic based on principles of Syariah. These programmes provide students with a sound theoretical and practical knowledge and skills base which are pre-requisites to successfully embark on a career in the banking sector or within the larger finance environment. Therefore, a primary objective of the programme is to develop knowledgeable and capable students to enable them to secure key positions in the financial services sector. Bachelor in Quantitative Studies programmes are designed to give students a solid foundation in fundamental mathematics concepts with an aim towards developing logical thinking and analytical skills to build their understanding of mathematical applications in industrial and commercial areas to meet the demand in both existing and emerging industrial sectors. Because of the evolving nature of these industries, students must be ready to learn new ideas and methods across a broad range of disciplines including mathematics, statistics, computational science, finance and management science. These programmes aim to provide the multidisciplinary foundations preparing quantitative analysts for this life-long development of skills and understanding and produce graduates who may seek employment in a wide range of financial areas, insurance, actuarial, operations, or financial risk management. All these programmes also provide a stepping stone to students who are interested in pursuing their study. The programmes also include an option for students to undergo an industrial internship programme which will equip them with practical employment skills. Provide you with a rewarding yet challenging learning experience to enable you to be a high quality graduates with the knowledge, skills and understanding for an effective and valued career. Enable you to undertake employment in industry, commerce or public service as professionals by developing your capabilities in relation to innovation, integration of ideas and concepts, interactive development, information provision and imaginative approaches to processes and problem solving. Provide you with a Personal Development Planning opportunity in relation to enhancing your employability through increasing your independence, inventiveness, ingenuity and developing your all round intelligence in relation to solving problems, decision making, working with other people and communication skills. Enable you to specialise in depth in areas corresponding to your ability and choice. 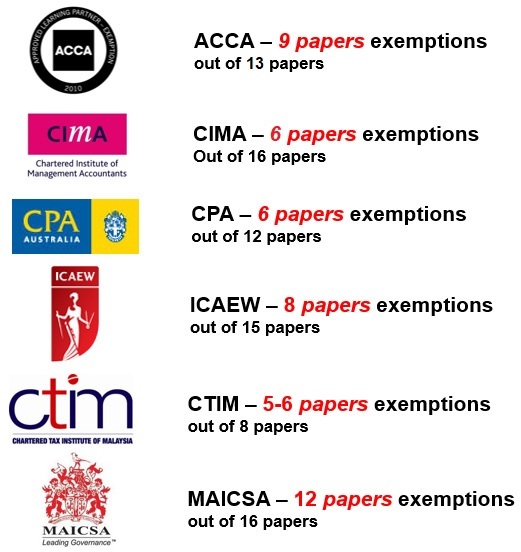 Also, Diploma in Accounting are eligible for 3 fundamental modules exemption from ACCA. A well-structured internship or industrial training programme in collaboration with industry is incorporated into the curriculum. The main objective of the internship programme is to further enhance your employability. In many cases the same company at which you had internship/industrial training will offer you employment as soon as you graduate. In all cases you will gain an invaluable insight into the world of business and managemet practices and be better equipped to position yourself for the career you seek.